Capacity: Max. up to 25 KG. We are engaged in offering clients with a qualitative range of Liquid gas Filling Stations. 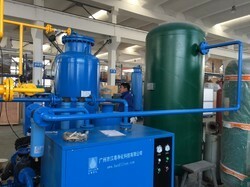 These are designed and manufactured for fill liquid carbon dioxide, Argon, oxygen, nitrogen etc into cylinders. Our range consists of a maximum of three weighing platforms and three high-pressure filling manifolds controlled by PLC. We are presenting an excellent quality assortment of CO2 Filling Pipe. Our precision engineered range of CO2 Generation Plant is available in various capacities and models as per the clients’ specific requirements. These are designed as per client specifications and can store liquids and gases under high pressures. The winding of the elements are manufactured in the latest state of art winding machines and specially designed wavy cut film is mainly used. So that zinc layer remains intact with the elements.